I couldn’t really end my commentary on Vegas without at least one picture. Fortunately my friend Ben has obliged with a picture that he took of myself and Lee on the roof bar at the Voodoo Lounge. I don’t know why I always make stupid faces in photos, I just do. 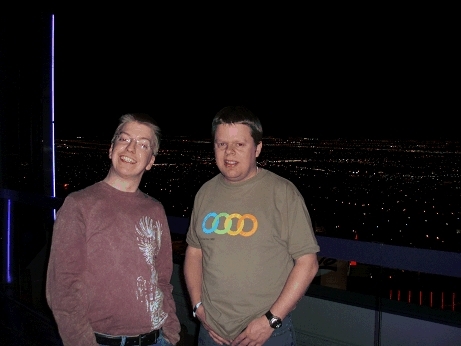 Lee and Richard have both posted on their Vegas experiences. Have to say that I agree with both of their entries, particularly Lee’s observations on wastage… although I don’t entirely subscribe to Richard’s views on the air conditioning – I don’t do hot weather, so this was good for me. After stepping onto the street for 5 minutes, I was suffering. That’s it. Finito. All done. Back to the real world.